The piles of pink-and-green rhubarb at the market are a wonderful sight to be seen. Nothing trumpets the arrival of spring – real hearty spring, not just the still-frosty beginnings on March 21st, but the cheerily triumphant blast of fine weather that quick-steps its way in during early April – than a fantasia of rainbow-stacked market produce. In a bid to encourage my boyfriend from consuming enormous quantities of sugar and chocolate throughout the week (how does he stay so lean? How? How? ), I’ve decided to have the occasional ‘pudding night’ at home. Although I’m not big into dessert as a regular fixture on household menu, I have no objections to something sweet after dinner once or twice a week. Thought the recipe for Rhubarb Tart contains that elusive ingredient – moist sugar – I figured that shouldn’t stop me from trying something new. INGREDIENTS – 1/2 lb. of puff-paste No. 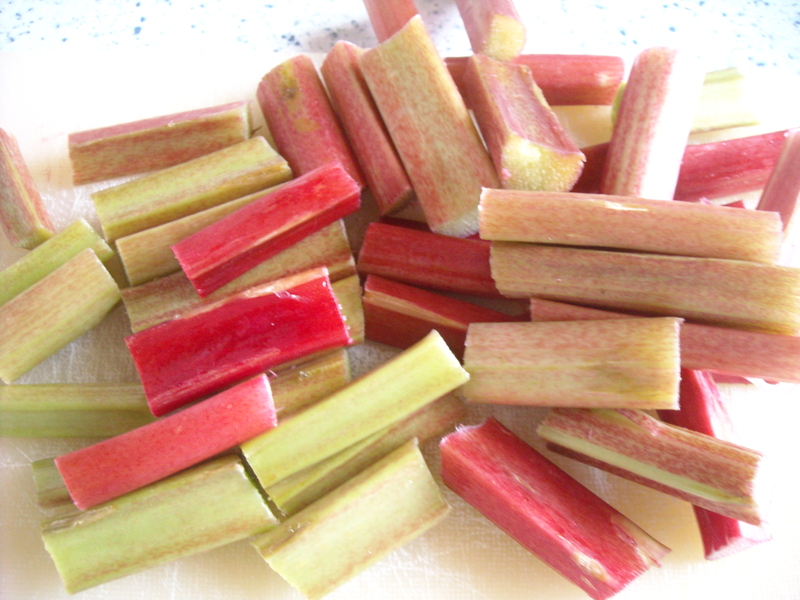 1206, about 5 sticks of large rhubarb, 1/4 lb. of moist sugar. 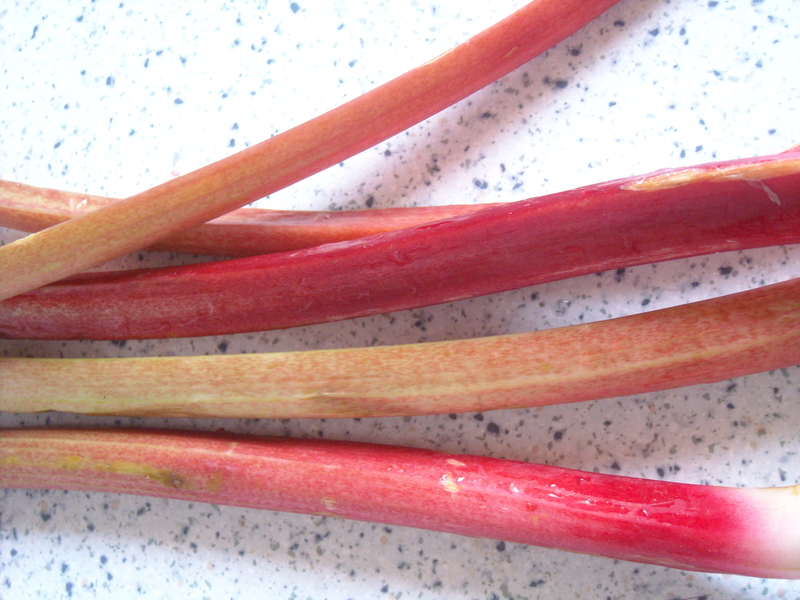 Already aware that rhubarb is possibly not my boyfriend’s favourite fruit (“I don’t like rhubarb”), I sense that he would probably enjoy it more if it wasn’t so, well, tart. This recipe certainly does that. Why the Victorians liked to consume enormous quantities of sugar (if Mrs Beeton’s recipes are anything to go by) is beyond me. When I started measuring out the sugar (moist or otherwise), I quickly realised that if I used the full stated quantity, this tart would come out of the oven swimming in sweet sickly liquid. My boyfriend may revel in that; I do not. So, I halved the quantity and prayed to the gods of Fussy Boyfriends that this revision would pass muster with my live-in food critic. “A small quantity of lemon-juice, and a little of the peel minced, are by many persons considered an improvement to the flavour of rhubarb tart”, states Mrs Beeton. 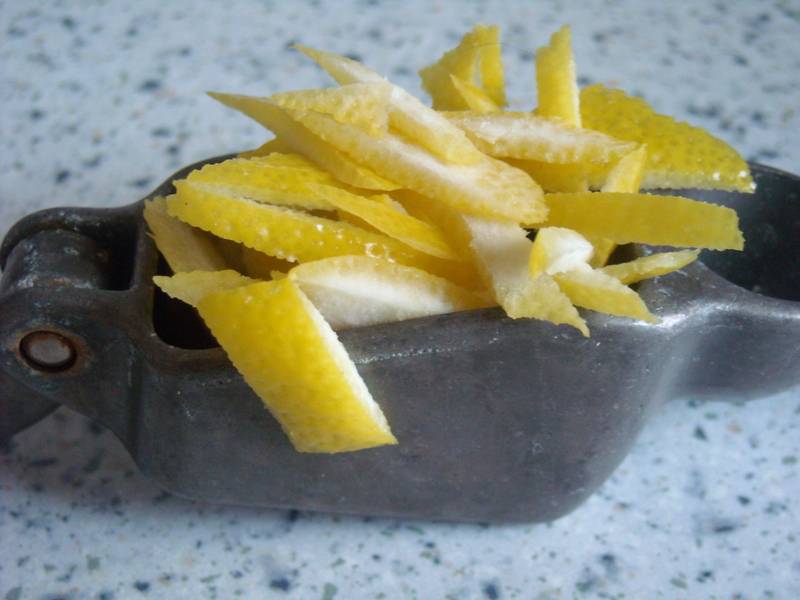 With the help of a garlic mincer (surprisingly, this worked marvellously when mincing small quantities of lemon peel), I added a good teaspoon and stirred it into the fruit and sugar mix. I cheated somewhat with the puff pastry, in the sense that I already had a pre-made pack in the fridge and thought it best to use this, rather than make some afresh. (Hey, at least it’s organic). 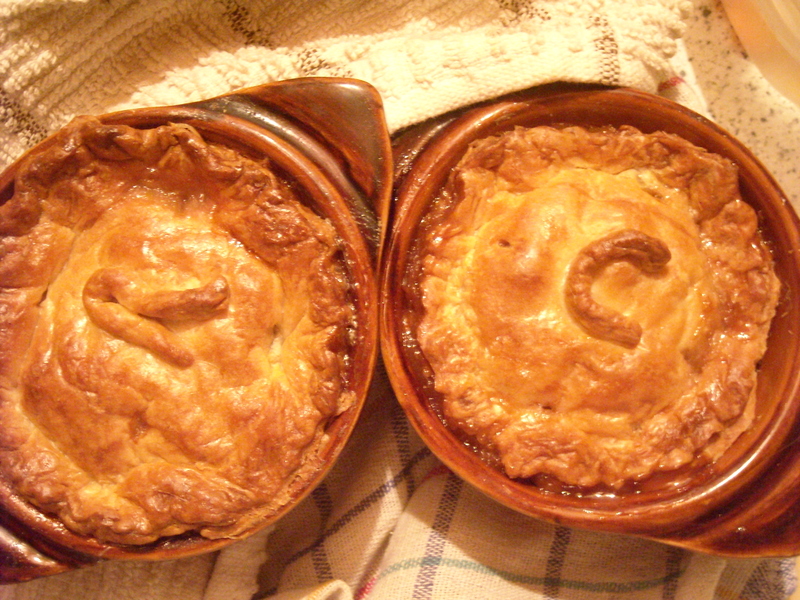 After a good 30 minutes in the oven, the ‘R’ and ‘C’ on each respective pie looked crispily, cheerily tan. I whisked them out of the oven and ran for the ice-cream. 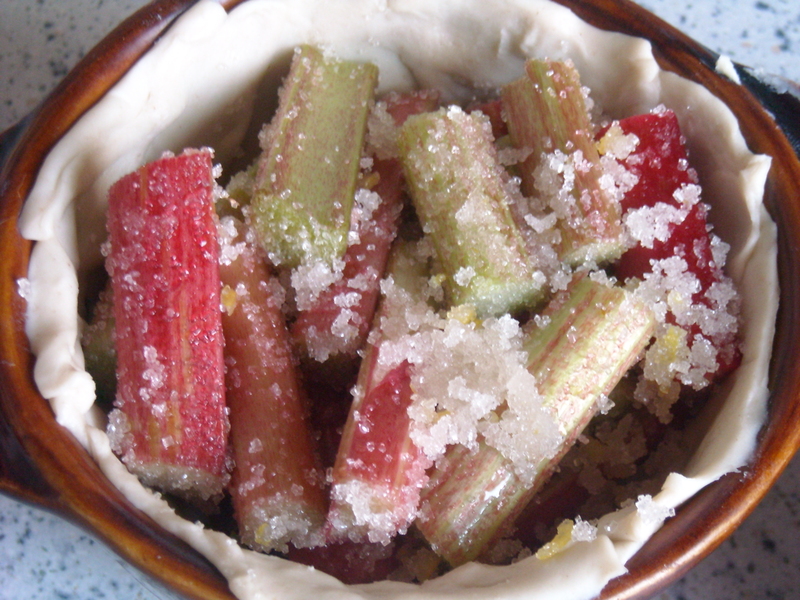 Rather to my surprise, the sugar seemed to have been almost completely absorbed by the rhubarb. “Mmmm, very nice. 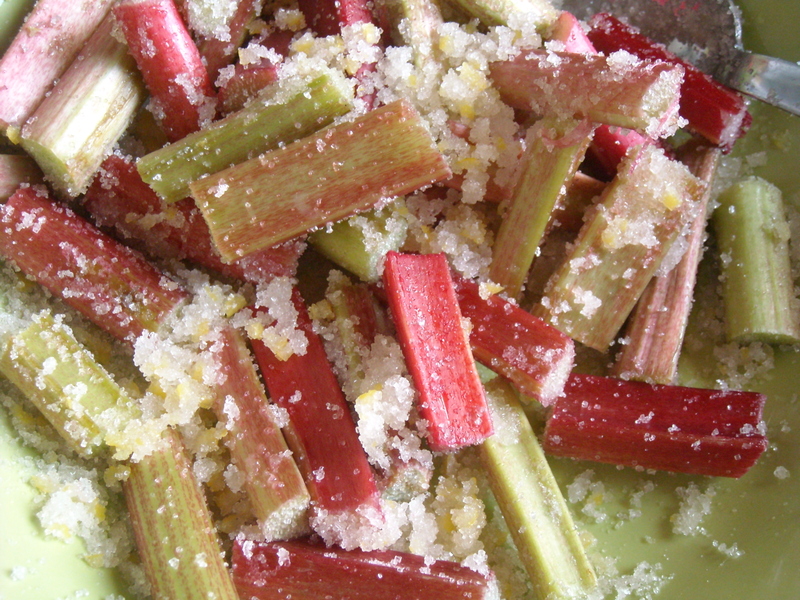 I like it,” commented my boyfriend as he downed a spoonful of vanilla ice-cream and rhubarb tart. “What, really? I thought you’d hate it?” I confessed with a surprised splutter. “No, it’s good – nice” he affirmed. I checked my glass of wine to see if I’d somehow consumed a bottle by accident. But no. This is a lovely fresh dessert – especially with a sweetly chilled complement of ice-cream on the side. This entry was posted on April 19, 2010 at 8:22 pm and is filed under food. You can follow any responses to this entry through the RSS 2.0 feed. You can leave a response, or trackback from your own site.